Recently, a user brought up the issue of questions that could seemingly be answered by looking in a dictionary and the responses given to those questions. Andrew Leach posted an answer that had a useful suggestion for improving this situation. 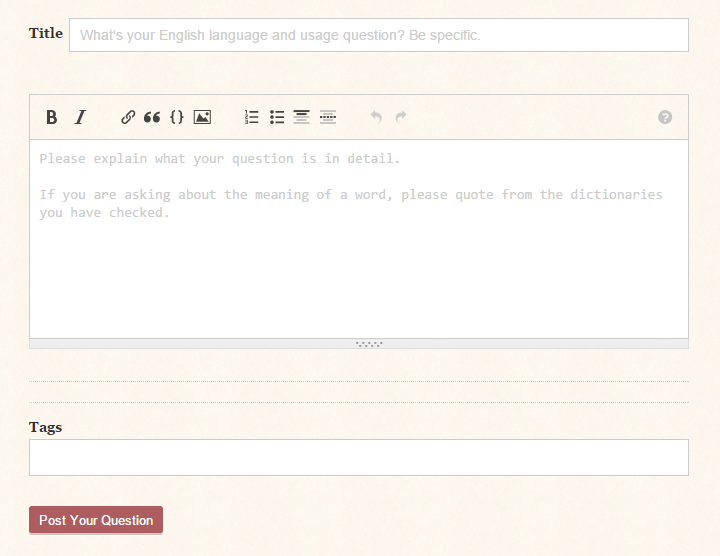 I think tinkering with the wording of the sidebar could help improve the quality of questions and also help users decide whether their question should be posted on ELL or ELU. The use of "learner" in ELL is unfortunate because I'm sure there are many people who think to themselves "I've been practicing English for 5 years. My question doesn't belong on the beginner's page." ELL is not a beginner's page. It seems that users with questions aren't going there first. I'm not sure why that is. 1) Can we collect some ideas for improving the sidebar? 2) If we all agree on wording changes, what are the appropriate next steps to suggest this as a change to the "authorities." 3) This might be a post that generates heavy comments on answers. To keep this neat and orderly, could people who post answers, take the appropriate comments and incorporate them into their answers, and could we delete our comments as we go? This will help the question and also keep moderators from having to delete comments, which could anger some. 4) Once we get an answer that has the most votes we can submit it. What suggestions would you make for improving the wording in the Question sidebar box? The guidelines seem pretty good to me: clear, straightforward, and easy to follow. I'm pretty confident the guidelines have helped more than one newcomer to formulate a half-decent question. In my opinion, the guidelines on the Ask Question page do not affect the influx of low quality questions that plague EL&U today. What concrete evidence do we have that newcomers are not helped by the instructions? What evidence do we have that suggest newcomers even read the list in the first place? What does the expression "way to go champ" mean? That's it. Nothing else was added. Nothing. Not even a link to show ‘where’ the user saw this phrase on the Internet. It received two answers. But at least those answers aren't taken from Wikipedia, or The Phrase Finder. The users who posted their answers have drawn from their personal experience and deadrat's answer tells the newcomer that the phrase can also be used ironically; there are links, citations and a good explanation on its meaning. In short, it is an exemplary answer, for a question that has ignored all the guidelines and instructions that the site kindly provides. resurfaces every few months or so on meta. It is my understanding that English Language Learners was created specifically to deal with the increasing load of off-topic, general reference questions that was flooding EL&U back in 2011. There is nothing new under the sun. "Are these sentences correct? "—Is a title like this enough reason to close a question? Has anyone discovered a way to encourage users to do some preliminary research before asking their questions? If the more experienced among us cannot come up with good questions, because let’s face it, writing a good question on purpose is really really hard. Why would a newcomer be any different? Furthermore, the emphasis on SE has always been on answers. A new user posting an answer will be rewarded with 10 rep for every upvote, whereas a question will earn only 5 rep, and yet a downvote carries the same weight for answers and questions. This does not encourage nor help regular users to post “good” questions. The "problem" lies with the site's name, its url address, english.stackexchange.com and the "problem" is that visitors see the website is populated by a good number of native speakers who are declared "experts", why wouldn't they answer their short simple question? Many people probably don't look at the side bar. Would it be possible to have some of the guidelines as a placeholder text in the question body box? Here's a quick mockup of what I mean, but we'd want to have a thorough discussion of what it should say.